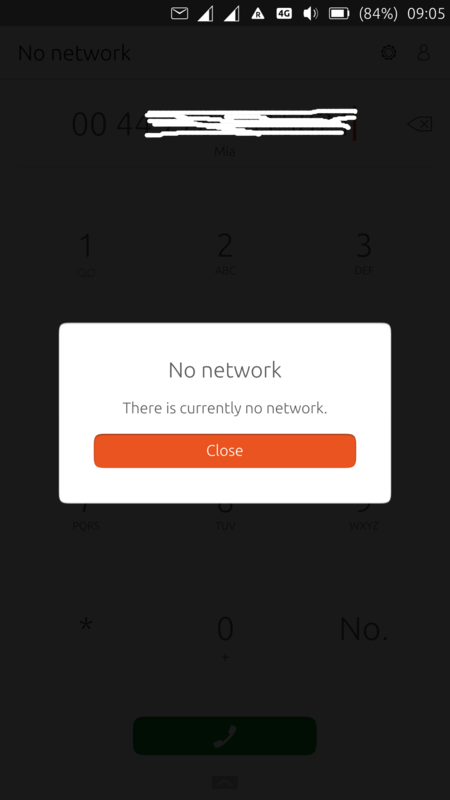 Initiate a call, finish the call and the screen immediately shows "NO NETWORK" message. No call are possible to make or receive at this time even when network indicator shows network as connected. This situation can last couple of seconds, up to some seriously long time...we're talking minutes here. Switching on and off the Flight mode or a reboot help to solve this issue temporarily, until the next call. Make or receive a call and upon hang up, there should be no problem to make or receive another call. also, the mobile network manager can't remember preferences set on dual sim phones. If selected one particular network for phone calls and texts, upon hang up, the preferred network for call is not selected. It seams to default to SIM1, for whatever reason. This is inconvenient, just in case if I need to make another call to the same No., if it chooses the other SIM, this could be costly call. Same here on my Pro 5 just that rarely it's about 10 seconds, usually more like about two or three seconds. Last time I counted the time, it was 20 seconds, in an area with a full signal. The first time, it only takes a few seconds, but repeating making a call and ending the call (make a call by selecting a phonenumber and hit the green phone button, than when it rings hit the red phone button) the time you'll see the 'NO NETWORK' message increases until it won't disappear and you'll have to reboot or try Flight mode on and off. seems that 16.04 stable is little bit better then the rc... so I'm staying on Stable for the time being. I confirm both issues on 16.04. But it is not true the second one was fixed in 15.04. I was suffering it also in latest 15.04. And moreover huge phone application flickering apperad after upgrade to 16.04. I think it could be related. Also, I'm getting phone calls but it's not ringing when the "No Network" appears!!!! This issue caused some problems to me since people are calling and I'm not answering, downgrading to 15.04 till a fix is released. Is there some possibility to rise the priority on this issue? It is quite critical. It is related to the phone's basic function. Are you guys on current rc? Quite critical bug. Is somebody working on it? OTA-6 and the issue persist. Same as on previous 16.04 OTA-5. Sometimes nothing else (flight mode on/off, data off/on ) only a reboot helps. It's rather a annoying when you trying to call someone, first call is not picked up and then can't make a second call as this is happening. Or the other party tries to call you and it goes straight to voice mail. I'm pretty sure the ubports developers are using Android or iOS as their main phones and don't care if Ubuntu touch users doesn't make or receive calls. yugioh2017 you don't need to be mean, they trying their best, in they free time, don't get paid for it (only a few of them). After all, if you don't like UT, nobody force you to use it. How about help them instead of such a statement? Stefano0101 I'm Ubuntu lover and that's why I'm talking like this, I don't need any features I'm ok with it but they called it a phone for a reason, so you can make and receive calls, I don't want to be forced to move to another OS because I can't make or receive calls it's really disappointing. I'm ready to help them and even pay to them so they can fix this annoying bug, I hope you understand me. yugioh2017, I am not a developer but an user. I fell your pain but I strongly disagree with the use of expressions like "really disappointing" or the idea that someone could pay and have things done. Please understand that I don't see myself as someone able to teach people lessons but rather I am learning what an opensource comunity means and that actually all that is part of the UT project, including the rithm at which bugs are solved. A huge majority of the Ubuntu Touch developers are, as noted in this thread, volunteers who do this out of their own passion for the platform. We are supporting a platform we didn't create on hardware devices that we don't have the source code to modify. I personally don't have this device and it's very difficult (read: expensive) to get one into the US. @yugioh2017, I understand that you're upset but yelling at people is not acceptable or helpful. Something useful to add to this report would be the contents of /var/log/syslog directly after the issue occurs. That would give us insight into exactly what has happened when "No network" appears. As it is, looking through the logs in this thread is difficult since I'm not able to find the log statements which are relevant to what we're trying to solve. I understand you perfectly. The other day I was at breaking point, wanted to smash the phone on the wall or floor. Couldn't make or receive a call, when needed, so stressful. Yeah, phone should be able to make a call when needed and you are totally right about that. Just comments like the one you made won't help. But maybe you wanted just stir the water so UBports guys notice this bug?!? Anyway, hoping the fix is on the way. Only who is using UT as a daily and main phone would know why I'm talking like this, I'm really sorry if I hurt you by my words, but also I hope you understand the problem here it been a month without taking any attention although it is really critical issue, I have faith in Ubuntu and UT and in UBPorts guys, I hope you guys help us here. This is one of the main reasons why we are moving to gitlab, we are aware that the bug system is not great and we do have a problem here. But gitlab has a much more promising bug reporting system allowing us to better utilize the bug system. Also please understand, we are a small team with a huge task, we have many moving parts and moving to a newer version of mir and unity8 at the same time is not helping, we are doing our best to make an an awesome operative system. but we are in a really busy period after taking over from canonical, we updated to xenial, we are updating mir and updating unity8 all these are huge since canonical left it far behind the latest releases, this forces us to make major changes. We are also building Halium and following the evolving of android and newer devices to be able to follow the mobile marked. At halium we are also trying to move our sensor, gps, media and camera system over to an active maintained system instead of maintaining our own. And we are also looking at merging our patched in celluar and pulse with an active maintained one. Once we move things to active maintained systems where we can work together to get to the same goal, we will then get more time to focuses on core functions. There is also a low amount of pro 5 out there with Ubuntu Touch, this results in out low amount of pro 5's in the qa team. This has resulted in this bug slipped the radar. Please if anyone here wants to help out our qa team let me know. And i'm deeply sorry that this happened, this should have been fixed before. I'll do my best to get it fixed asap! I'm ready to help QA team, let me know if and when testing is needed. syslog attached, right after No network message, after 3 calls, then no network for a long time. "they" broke the phone not "we" or "us", it was working perfectly till "they" got involved. I'm no longer waiting the fix. Then, the UBPorts slogan should be: We broke UT functions and you should find a developer to fix them. No useful input here, locked. As I said before, this bug will be fixed, i will even try right now even although its xmas. we try our best to fix as many bugs as we can, but we don't have apple money and developers. But the fact is that there is a lot of bugs, and the pro5 has little userbase so its not always it will get the highest priority. There we go, a fix for it. Merry Christmas everyone! Finally!!! Thank you!!!! Merry Christmas everyone (including Ubports team :P) ! Long live UT! Beautiful! Wonderful! Fixed! Thank you! Merry Christmas! Thank you Marius, it seems to be fixed, no trouble with it now. If I observe anything else, I'll let you know. Merry Christmas! Thank you Marius! Tested it in Dev mode (BQ E4.5) and the problem is gone! This bug was, as for many, a very big problem for me. Fix works. I could not reproduce this issue. Tested OTA-7 (rc) and the issue is gone, fixed for good on Meizu Pro 5.